Hill of Montjuïcis Barcelona, altitude in the District Sants-Montjuïc is the hill of 184.8m.The fortress to protect the town was Cane on the top. 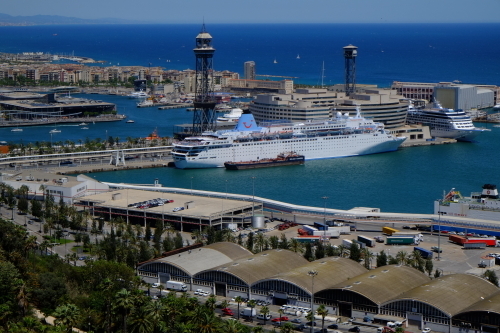 Currently has MontjuïcCastle built. 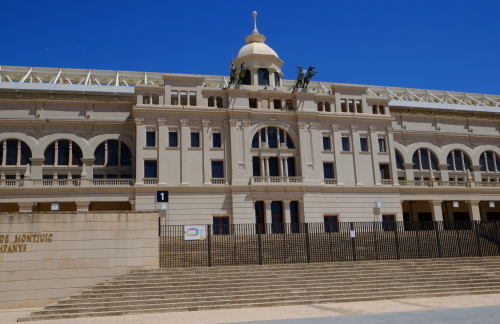 Is part of the development of the hill go in Barcelona World'sFair, the central region of Montjuïc of name has been developed. 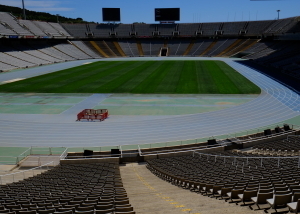 Estadi OlímpicLluís Companys, Palau San Jordi became the Barcelona Olympics main venue of1992. 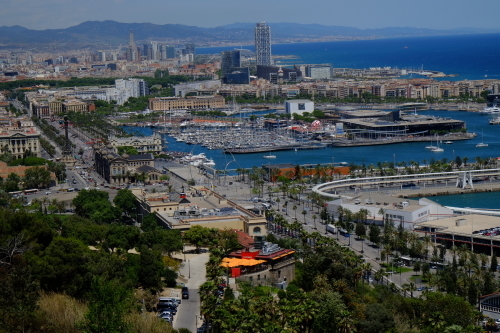 From the hill of Montjuïc, Barcelona Port and the city of Barcelona I wasable to overlook. 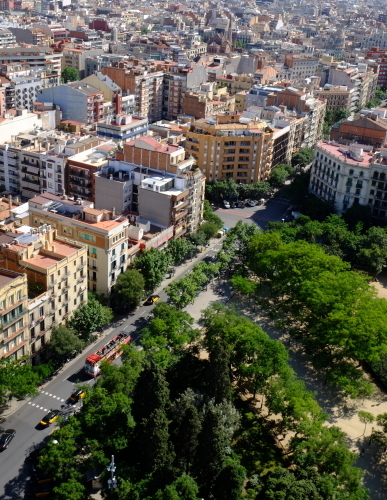 The origin of theearliest settlement at the site of present-day Barcelona is unclear. Around theactual neighborhood of Raval have been found remains of an early settlement,including different tombs and a hut from 5.500 BC. The founding of Barcelona isthe subject of two different legends. The first attributes the founding of thecity to the mythological Hercules. The second legend attributes the foundationof the city directly to the historical Carthaginian Hamilcar Barca, father ofHannibal, who named the city Barcino after his family in the Third centuryBC.In about 15 BC, the Romans redrew the town as a centered on the "MonsTaber", a little hill near the Under the Romans, it was a colony with the surname of Faventia, or, infull, Colonia Faventia Julia Augusta Pia Barcino[or Colonia Julia AugustaFaventia Paterna Barcino. 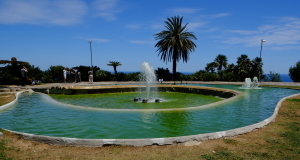 Pomponius Mela[mentions it among the small towns ofthe district, probably as it was eclipsed by its neighbour Tarraco , but it maybe gathered from later writers that it gradually grew in wealth andconsequence, favoured as it was with a beautiful situation and an excellentharbour. It enjoyed immunity from imperial burdens.The city minted its owncoins; some from the era of Galba survive. Basilica of LaMercè Important Roman vestiges are displayed in Plaça del Rei underground, as apart of the Barcelona City History Museum MUHBA; the typically Roman grid planis still visible today in the layout of the historical center, the Barri Gòtic. Some remaining fragments of the Roman walls have been incorporated into thecathedral.The cathedral, also known as the Basilica La Seu, is said to havebeen founded in 343. The city was conquered by the Visigoths in the early 5thcentury, becoming for a few years the capital of all Hispania. After beingconquered by the Arabs in the early 8th century, it was conquered in 801 byCharlemagne's son Louis, who made Barcelona the seat of the Carolingian"Hispanic March" , a buffer zone ruled by the Count of Barcelona. The marriage ofFerdinand II of Aragon and Isabella I of Castile in 1469 united the two royallines. Madrid became the center of political power whilst the colonisation ofthe Americas reduced the financialimportance of Mediterranean trade. Barcelonawas a center of Catalan separatism, including the Catalan Revolt (1640–52)against Philip IV of Spain. The great plague of 1650–1654 halved the city'spopulation. In the 18thcentury, a fortress was built at Montjuïc that overlooked the harbour. In 1794,this fortress was used by the French astronomer Pierre François André Méchainfor observations relating to a survey stretching to Dunkirk that provided theofficial basis of the measurement of a metre. The definitive metre bar,manufactured from platinum, was presented to the French legislative assembly on22 June 1799. 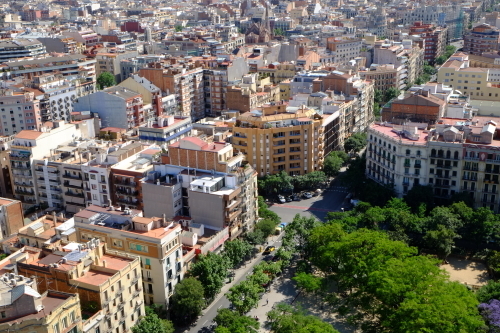 Much of Barcelona was negatively affected by the Napoleonic wars,but the start of industrialization saw the fortunes of the province improve. During the SpanishCivil War, the city, and Catalonia in general, were resolutely Republican. Manyenterprises and public services were "collectivised" by the CNT andUGT unions. As the power of the Republican government and the Generalitatdiminished, much of the city was under the effective control of anarchistgroups. 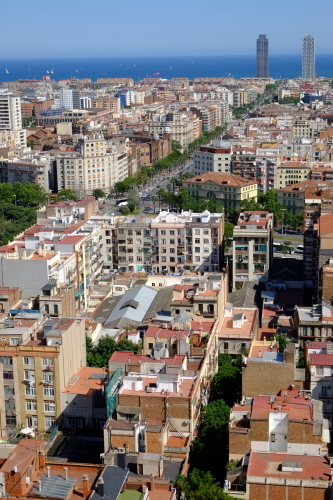 The anarchists lost control of the city to their own allies, theCommunists and official government troops, after the street fighting of theBarcelona May Days. The fall of the city on 26 January 1939, caused a massexodus of civilians who fled to the French border. The resistance of Barcelonato Franco's coup d'état was to have lasting effects after the defeat of theRepublican government. 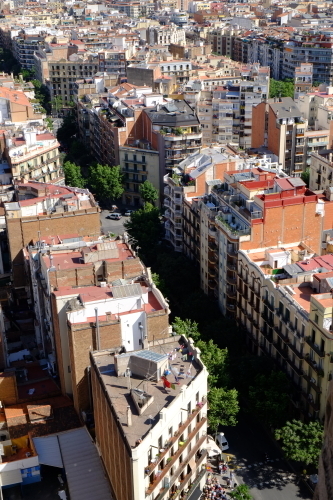 The autonomous institutions of Catalonia wereabolished,and the use of the Catalan language in public life was suppressed.Barcelona remained the second largest city in Spain, at the heart of a regionwhich was relatively industrialised and prosperous, despite the devastation ofthe civil war. The result was a large-scale immigration from poorer regions ofSpain , which in turn led to rapid urbanisation. The city gained vitality in 1992when it hosted the Olympic games. Spain, whichjoined the European Union in 1986 through the end of the Franco dictatorship,continued economic growth to chase other member countries. From the late 1990s,domestic demand of real estate and construction industry becomes growthpotential, in 2000 - the average annual real GDP growth rate of 2007 is showinga strong first time in more than 3%. In particular, the real estate marketgrowth is remarkable, and in 2003 became a growth rate of over 20 percentyear-over-year. However, the ratio of real estate accounted for gradually Bankof receivables I drew rise, attention as a real estate bubble state. Sub-prime mortgagecrisis from the United States in 2007 has surfaced, and spread to the globalfinancial crisis, Spain had become a bubble state became the stretch recessionstate. Collapse of real estate prices this year in the wake, real growth rateof GDP fell significantly from -3.7% in 2009. Government spending also fellinto in 2009 to -11.1% and a significant deficit, began to sovereign risk isshouted. By this time, it came to be enclosed as PIIGS together with thecountries that have faced similar problems.